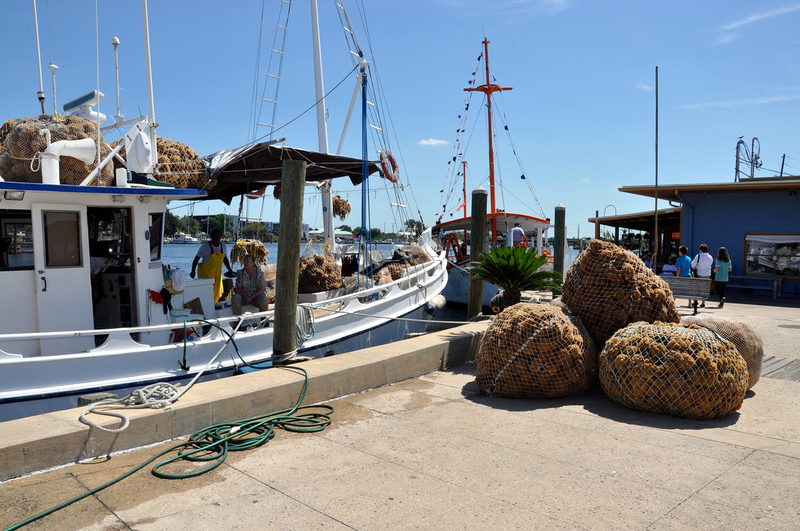 Although a small coastal town, Tarpon Springs draws many visitors with its famous sponge docks off Dodecanese Boulevard. In fact, it’s known as the “sponge capital of the world” because of its booming sponge-diving industry since the early 20th century. There’s more to the area than just sponges, however. The sponge docks also showcase Tarpon Springs’ strong Greek heritage as well as a variety of local stores and restaurants. You can even go on a cruise or a fishing excursion here! Get a taste of the Mediterranean and enjoy these things to do while strolling down the sponge docks in Tarpon Springs. From big nets of sponges on the docks to buckets and crates of sponges spilling out of stores, it doesn’t take long to figure out what the main commodity is in Tarpon Springs. Naturally, most of the stores sell sponges like the Spongeorama Sponge Factory, which boasts to have the world’s largest collection of natural sponges. This place also has a free museum and theater located in the back of the store where you can learn about the area's history. With an abundance of sponges, it's only natural that some retailers at the sponge docks also sell bath and body products like Lori's Sponges and Soaps. The variety of soaps, bath products, and skincare sold here make this shop a perfect stop whether you're a bath and body junkie or looking for great gifts. Who couldn’t use some soap?! A number of stores at the sponge docks also have Greek statues, ceramics, jewelry, and religious items commemorating the culture. Gift World GreekTownImports is one such store dedicated to carrying these products plus Tarpon Springs souvenirs and sponges. Not too far from Clearwater and St. Petersburg, Tarpon Springs has a number of shops with beach gear and apparel so you’re ready to have fun in the sun on Florida’s west coast. Seaside Paradise sells hats, shoes, and other essentials as well as Salt Life merchandise for those who are all about the ocean. Walking down the boulevard, you’ll also notice some specialty stores like Serafin de Cuba Cigars, The Spice & Tea Exchange, and Wine at the Docks of Tarpon Springs, so there’s something for everyone to explore at the sponge docks. Not surprisingly, there are a number of amazing Greek restaurants in Tarpon Springs like Hellas Restaurant and Bakery and Mykonos. If you’re new to Greek cuisine, we recommend trying spanakopita, a savory pastry filled with feta cheese and spinach; nix the spinach, and it’s called tiropita. Other popular dishes include Greek salad, gyro pitas, and moussaka, a casserole with beef, potatoes, and other vegetables. The sponge docks at Tarpon Springs also have several seafood restaurants like Rusty Bellies Waterfront Grill, known for their fresh catches, cocktails, and waterfront views. After grabbing a bite, satisfy your sweet tooth by walking over to Sweeties for your favorite ice cream treat or, if you’re looking for something more decadent, get a square or two of fudge at the Fudge Factory. The sponge docks are nice to walk around during the day, but you can also visit at night as many of the shops and restaurants stay open in the evening. Situated on a river and near the Gulf of Mexico, the sponge docks offer wonderful sightseeing opportunities in the way of cruises and fishing charters. Take a relaxing boat ride with Spongeorama Cruise Lines or Odyssey Cruises and see dolphins or the sunset, a perfect way to end your day. The Tarpon Springs area has plenty of fishing charters, but the most popular off the sponge docks are Viking Gulfstar Fishing and Dolphin Deep Sea Fishing. Experienced fishers will take you to ideal fishing spots, so all you have to do is enjoy the ride and cast your line! If you plan on taking a cruise or fishing charter, make sure to book your reservations in advance as these types of businesses are typically not known to take walk-ons. Whether you enjoy browsing stores, finding new favorite eats, or exploring the waters, the sponge docks in Tarpon Springs are a great place to spend a leisurely day on the coast. Find more things to do in Tarpon Springs by registering on 727area, your free guide to everything in the St. Petersburg and Clearwater area.